A bartender to guest ratio of 1 to 75 will usually provide efficient service. If a single bartender is required, a ratio of 1 to 50 or lower is recommended depending upon whether it is beer, wine, soft drink service or full bar service. Beer, wine, soft drink service is much faster than full bar service due to less time taking the party goer’s order and it takes longer to pour a mixed drink than to pour a portion of beer or wine. Hint: Have a display of the available beverage selections visible around the bar. In the case of weddings where the reception is held at a location other than that of the ceremony, guests will usually filter in over a 30 minute period of time which allows you to use a larger bartender to guest ratio. On the other hand, if the reception is held at the same location as the ceremony or if everyone for a corporate event is expected to arrive by bus at the same time, a smaller ratio is required for efficient service. The size of the room, the number of attendees and the traffic flow are the main considerations when determining where you will place your beverage service area. In no instance, should the beverage service area be placed immediately by the entrance since it lends itself to high congestion in an already high traffic area. By properly placing the beverages and food away from the entrance you give the attendees a reason to enter the room rather than to linger at the entrance. Food and beverage areas should also be separated to minimize congestion and to created traffic flow throughout the room rather than creating clustered congestion in one area. Proper traffic flow and movement by the attendees can add to the energy of an event! In most instances, unless it is a very large room or there is a large number of attendees, combining the beverage service areas into one larger service area will increase the service efficiency. In most cases the available bar service area of 5 feet per 100 guests is the minimum required. For example: a bar area for 300 guests should be a minimum of 15 feet side to side keeping in mind that the required number of bartenders will each require about 4 feet of room. The size of the room, the number of attendees, and the traffic flow are the main considerations when determining where you will place your beverage service area. In no instance, with the exception of butler passed champagne or a theme drink offering, should the beverage service area be placed immediately by the entrance since it lends itself to high congestion in an already high traffic area. By properly placing the beverages and food away from the entrance you give the attendees a reason to enter the room rather than to linger at the entrance. Food and beverage areas should also be separated to minimize congestion and to created traffic flow throughout the room rather than creating clustered congestion in one area. Proper traffic flow and movement by the attendees can add to the energy of an event! In most instances, unless it is a very large room and/or there is a large number of attendees, combining the beverage service areas into 1 larger service area will increase the service efficiency since splitting the areas creates uneven traffic flow to the service areas. More often than not, one service area will be overly busy while the other is not creating slow service in one area and wasted unused labor at the other area. In most cases the available linear service area of 5′ per 100 guests is the minimum required. 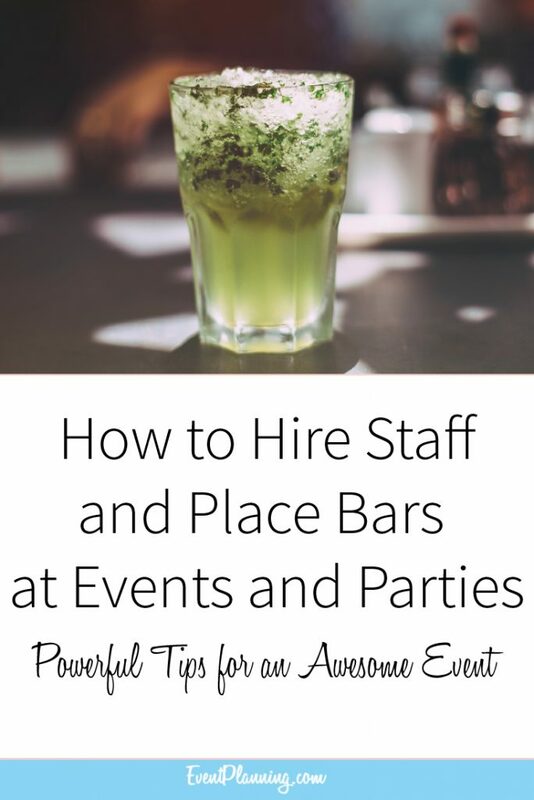 Example: The bar area for 300 guests should be a minimum of 15′ side to side keeping in mind that the required number of bartenders will each require about 4′ of area.